Hello early adopters, please enjoy page one of our journey! This is the opening for our story. We open on a daring escape towards freedom. One thing that I wanted when I first thought of this character was that he had pots for feet. The midpoint committee that reviewed this hated that idea, and pretty much everyone agreed. So the pots won’t be around for long; enjoy it while it lasts. 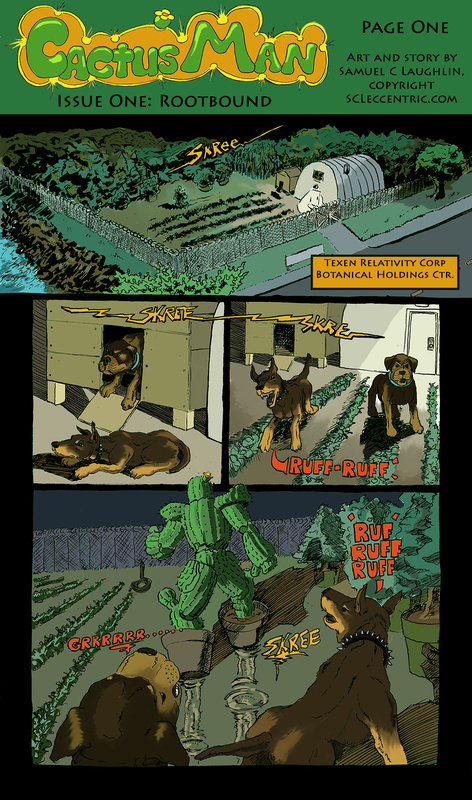 For this page, I did research at the local dog park at Point Isabel. Seeing the shapes and movements of the dogs was very helpful. Research is crucial for illustration. Unfortunately, I don’t have a dog to model for me. This place is too small for the both of us. At least I can put dogs in comic pages. I hope you enjoy, and come back often for updates! Really fun opening. Love the dogs!! Like what you’ve done with the colors. I worry that Cactus man is going to bang his ankles together and break his pots. Maybe a nice pair of huaraches? Love the dogs. Don’t worry, the pots-for-feet experiment won’t last past page three. They are an impediment, I know. But its the perfect throwaway idea for critics to reject.